How set up: Note that the dark circles in the drawing are either cones or corner flags and the empty circles are simply used to help measure distances. Distance from the middle of the front edge of the player area to each gate is 12 yards for U11 thru U14 and 10 yards for U9 & U10. Each gate is 3 yards wide, corner flags are used to make the gates. Using corner flags removes the problem that will arise if the ball were to hit a cone. Need 2 people to catch the balls â€“ they should hold onto them until the player is done. They immediately return to get another ball, set it up, and then try to pass through the left-hand gate with their right foot. They keep alternating between the right and left gates for 1 minute (adjudicator does the timing). Passes made from beyond the end of the player area do not count! Passes with the wrong foot do not count. Start the timer when player starts (either the player or the adjudicator can say "go"), and let it run for 1 minute. Let the player know when the 1 minute is up. 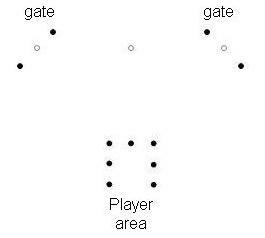 For each foot individually, count the number of balls that make it through the gates. Ball must be kicked with the correct foot to count.